My ‘roots’ within the Extreme Metal scene go back to half of last century’s Eighties. It was an era with many promising things coming up. Around that time (late Eighties / very early Nineties), there were quite some labels that tried to support and promote the scene, but in the meantime, there are not that much that still wander around. But one of the labels that was of high importance back then, and which is still a notorious one right now, is Osmose Productions, which brought us, back then, material from excellent, notorious, and highly influential bands such as Necromantia, Impaled Nazarene, Immortal, Master’s Hammer, Marduk and so on – indeed, not such an inferior curriculum vitae it is for sure. Throughout the years, for about three decades, I do follow this label, and I still have the impression that they are staying true to the essence (or at least most of the time): releasing superb stuff that pays tribute to the roots of all Sonic Evil. One of their first Osmose releases in 2019 is Seek What They Sought by the English duo Pernicion. This outfit consists of vocalist Dan Benton, who used to be part of the Kataleptic line-up, and multi-instrumentalist / composer Anil Carrier, whom you might know from his present or former collaboration with e.g. Arrogant Destruktor, Binah (in a near future, I will publish a review for their newest effort Phobiate, released via this very same label), Throes, No More Room In Hell, or Anaal Nathrakh as live drummer, amongst others. Anil took care of recording, mix and mastering of the album (in a studio in California, The Barracks Studio, where bands like Anaal Nathrakh, Nomos, Bleeding Through, Wormreich and Carnifex did record some of their material too, and being the headquarters for the Pvre Evil label). Seek What They Sought will be released on compact disc, on black vinyl and digitally, and the five tracks have a total running time of little less than half an hour. What this duo brings with Seek What They Sought is truly monstrous – and that’s a compliment! This album collects five pieces that offer the audience that kind of Death Metal that is both intriguing and scarifying! It’s harsh, it’s fast, it’s uncompromising and it’s timeless too. Mainly fast, technically skilled riffs and leads are interspersed by some ultra-heavy, abyssal decelerations, and brutally raped by several sudden pyroclastic outbursts. The leading guitar work is technically performed, with a modern, little discordant execution, which adds a certain specific ominous and hypnotic thing. The performance is scientifically precise, going for both the down-tuned tank-riffs as within the fiercer structures. On top of it, and that’s because of the splendid production, the interplay with the vocals and rhythm section is top-notch. The latter, those vocals, well, they are of the most cavernous, funereal kind, and within the slower passages, that ‘funeral’ aspect takes over the whole atmosphere. No, I won’t pretend that this is Funeral Doom you’ll experience, even not within the slowest pieces; but the atmosphere, the attitude, the experience is comparable for sure! Fine too are the pushing and pounding bass lines, at least as prominent and of importance as the pummelling guitar leads, and due to the great mix as manifest, explicit. On top of all this, you have those monstrous and thunderous drum patterns – truly so supportive and uplifting. Pernicion have something that reminds me of the Old School for sure. Without making comparisons (though, I can’t help it to refer to acts like Asphyx, Morgoth, Incantation or Demilich, hehe), there is that primal and essential uncompromising attitude and that lacking of modernistic (and superfluous) addition: just the purity of Death Metal. But the band’s approach has a contemporary touch too, reminiscent of some of those so-called Metal-of-Death bands that overpower the audience lately (and hey, I am not complaining at all!). 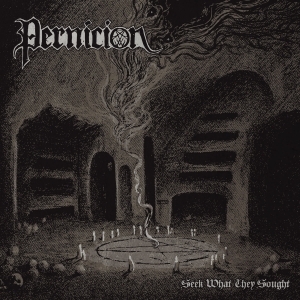 It is Pernicion’s technically skilled song writing, and those mesmerizing riffs, that make the difference with ‘average’ modern bands.